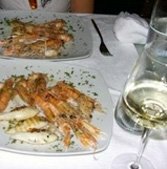 Romantic seafront restaurant with delicious Mediterranean cuisine. The indoor dining room has a quaint, home-style atmosphere, while the outdoor veranda is best for watching the sunset while enjoying a bowl of spaghetti alle vonghele. Specialties include: Seafood salad, bruschetta with clams, gnocchi with clams and rocket, and home made desserts. Fregene is about 40 minutes from Rome.